This post is written by Hanna Griff-Sleven, Director of Cultural Programs and Intern Coordinator at the Museum at Eldridge Street. 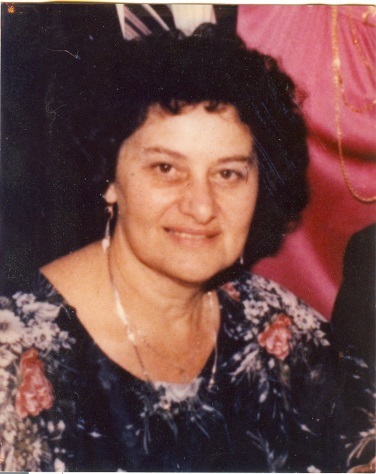 My mother died on the 5th of Kislev in 1991 (November 12th) and this year her Yarzheit (the anniversary of her death) is on Thanksgiving. The Jewish calendar is a lunar one and every few years her Yarzheit falls on Thanksgiving or my wedding anniversary (November 11th). This is not a sad thing, because more than any holiday during the year, and even though she was a very religious woman, I think of her on Thanksgiving. For many years I was the child in our family that lived the furthest from home and my parents made it a point to visit me for Thanksgiving. Thanksgiving worked as it was the rare occasion when my father actually took time off from running Griff Furniture in Waltham, Massachusetts. Back then, business was slow between Thanksgiving and the first week of December – before stores were open on Thanksgiving and Black Friday. 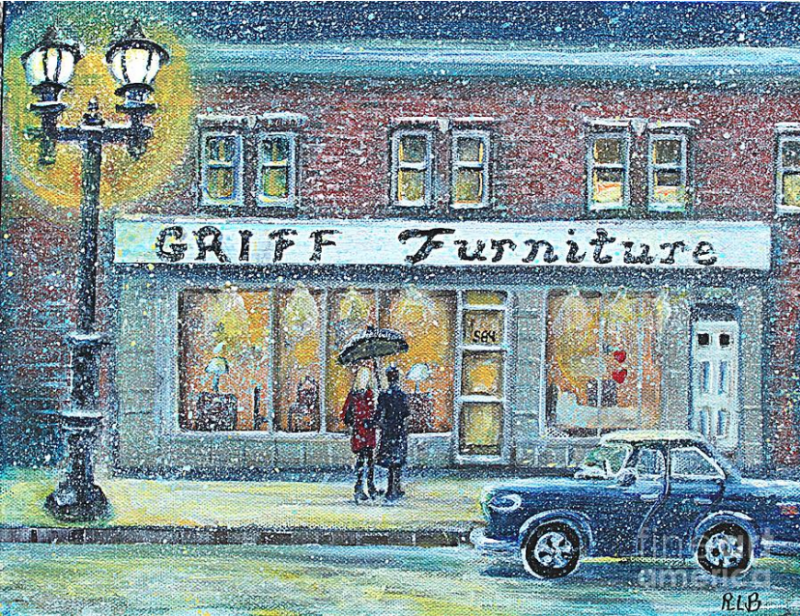 Painting of Griff Furniture, Waltham, Massachusetts. By Rita Brown. Our first Thanksgiving together was when I lived in Nantes, France during the fall semester of my senior year at Grinnell College. My hosts, the Bichons, got almost as excited as I did with the thought of entertaining my parents. I had intrigued my newfound French family as I never ate the pork they had at almost every meal. Once they found out I was Jewish and kept to a kosher-ish diet, they made it a point to serve lots of vegetable dishes for dinner. Right away Mama Bichon started planning the menu. When I told her my mother was very observant and would not eat any meat, just fish and vegetables, Mama gasped and then said, “Ah, we must have the beurre blanc and I will get our housekeeper to make it because I am not a native born Nantaise and I can’t make it. Olalalala.” The Bichons prepared a glorious French meal, starting with aperitifs and moving deliciously through seven courses, featuring the beurre blanc over hake. There were many wines from the Loire Valley, changing color and bouquets as proscribed by each dish. My mother was not a drinker, but the Bichons urged her to take a sip from every bottle and I saw my mother a bit tipsy that night. Her cheeks got bright red and, usually a very quiet dinner companion among guests, she spoke French alongside my loquacious father, at first only answering questions haltingly but gradually taking the risk and telling a story or two (both my parents were great linguists and had studied French in high school and in my father’s case, college). Dinner went way past midnight, as any proper French meal should, and was enjoyed by all. After college, when I went to graduate school in Indiana, my parents came on Thanksgiving and with them came Ma’s catering. Kosher turkeys were non-existent in Bloomington, Indiana during the 1980s but that didn’t faze my mother. She would cook the kosher turkey and all the trimmings ahead of time, then freeze it and pack it up hours before she and my father flew to the Midwest. I remember waiting at baggage claim, praying no one took the box of kosher turkey, stuffing and apple pie. The six years I lived in Bloomington no one ever stole Ma’s pre-cooked kosher turkey and my parents became my friends’ parents every Thanksgiving. Within our family she was a strong, sometimes funny, sometimes sharp tongued, but always warm and loving. I wanted my friends to know those parts of her and as the years went on, they did. In my third year of graduate school, she developed breast cancer and after the initial shock, she and my father continued to journey to me for that week – she still catered the dinner herself! My mother fought cancer bravely for about six years and when she died, Thanksgiving was the first holiday we had to celebrate without her. I had been able to take a leave of absence from teaching at Grinnell College and I celebrated the holiday that year in Massachusetts. My sister and I stayed with my father, doing all the things one needs to do when a parent or spouse dies – gathering her clothes and giving them away, signing many papers and taking care of my father. Thankfully, my cousin Ethan who lived out in western Massachusetts at that time invited us to Thanksgiving dinner. It was a cold but sunny New England day. The road we took wound in and out of hills and countryside dotted with cows and horses and even some snow. My father, my sister, Lois, and my father’s sister, my Aunt Evelyn, were in the car. We three were all silent while my father talked on and on about my mother and our life with her. It was a touching and sweet ride. We made it to my cousin’s house and he, his wife and their son Corey were waiting in the driveway with open arms. Lois had bought Pilgrim hats for us and we put them on and made ourselves at home. Ethan had been a cook for many years and he had made many different types of stuffing, thoughtfully accommodating everyone’s dietary needs and tastes. We ate and talked and laughed, took a long walk in the countryside and I somehow felt my grief lift a bit that day. Life goes on, and my mother would have been happy we were with my father celebrating together. After she died, our family made sure that at least one of us went to be with my father every Thanksgiving. Many times we all gathered in Waltham and cooked the meal ourselves, with my father acting as supreme sous chef. He’s since passed away, too, and I miss him helping me chop and dice while talking away. He loved nothing better than being in the kitchen while the meal was being prepared. As fun and heimish as Thanksgiving became after my mother died, there is always a moment when I think of just her, pulling out dish after dish of kugels and cookies and pies and the kosher turkey from that brown box that flew all the way from Boston to Bloomington. My sister lives in New York as well. She and I always go to the same morning minyan on the Upper West Side and the same faces are there to welcome us every year. If it’s a Torah day, as it will be this year, at least one of us gets an Aliyah. Ma is there, reading the blessings over my shoulder. Scatter the other half of the chopped onion around the turkey, once it is put in the roasting pan. Pour a good amount of OJ over the turkey and put in oven and cook for 2 and a half hours or until meat is no longer pink at the bone, throwing some OJ on every half hour or so. Put a tent of aluminium foil on the turkey and cook another half hour until meat is tender. Remove the turkey from the oven and allow the bird to rest for about 10-15 minutes before slicing. Be the first to hear about Museum news and events.